How Do You Taint A Block Party? Lobby For A Freeway! For most people who live in Alhambra, the pedestrian is a second rate participant on the city’s roads. Car dealerships line Main Street in the north, wide four lane streets run along Valley. So, to see Alhambra close one of the busiest north-south arteries in the city from 11 am to 2 pm on a Wednesday was beyond surprising. 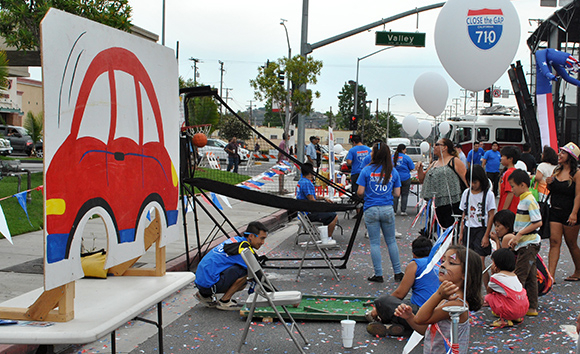 Alhambra’s “Close the Gap” event blocked Fremont Avenue from Valley Boulevard to Mission Road from 11 am to 2 pm. Wednesday to automobile traffic as a way to promote the Interstate 710 expansion project. Alhambra hasn’t closed a street since the annual Jubilee ended a few years ago, but that event happened on a minor side street off Main Street that doesn’t get nearly as much foot or car traffic. Art Beanda, 46-year-old Alhambra resident, sat with his two children in front of the apartment complex off Fremont Avenue. After four years at the apartment complex, the block party gave Beanda his first chance to meet his neighbors. “You see them and I mean, this guy lives here and you just say hi, but from far away,” Beanda said. 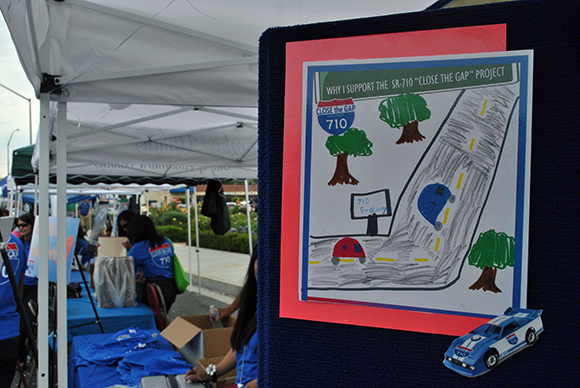 While the block party is a great direction Alhambra is headed for pedestrian activities, the association to the highway project felt odd. It’s great to see Alhambra close off a street for a recreational activity, but I’ve never heard of a pedestrian friendly event lobbying for a highway project. One step forward for Alhambra pedestrians felt like a step back by lobbying for the highway project. Whether or not the 710 project goes through or not, will Alhambra continue to use July 10 (7/10) to promote the existence or non-existence of the expansion? Probably not. 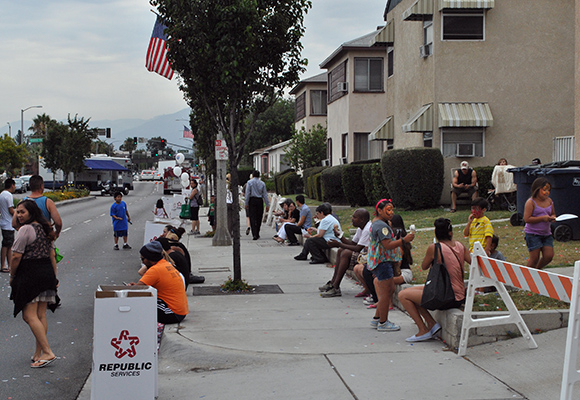 Hopefully it’s not the last block party in Alhambra, but it would be best to move this ped-friendly activity back to, you know, promoting livable streets. 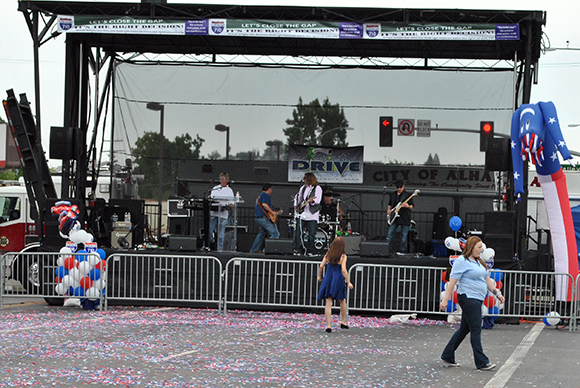 And, here’s a treat from Lauren Gold on Alhambra’s amazing civic pride. Kris Fortin was born and raised in Alhambra. It’s really nice to see people out in front of their homes, meeting their neighbors and enjoying their street without any cars. NONE! Make it bike and ped all the time. Snap off the stubs and let people enjoy each other. Sounds great Mile G! How about we do a tear-down from Valley to the 10 and create a ped/bike friendly open space. That should solve Alhambra’s traffic problem. – Put BRT on Valley and Colorado while we’re at it. – The 110 north of I-5 is a death trap. With north-south traffic able to travel under SGV let’s convert that stretch to a surface road with traffic calming and reunite the Arroyo Seco neighborhoods. Doesn’t arguing for these possibilities sound more fun then shouting NUMBY? neopangaea, you might want to go back into the archives to check out the Multi-Mode/Low-Build Alternative (MMLB). This is a non-freeway alternative that could be constructed at a fraction of the cost of the toll tunnels (1-2%) and alleviate present traffic without creating additional traffic which a freeway or tunnels would bring. A key component of the MMLB is resolving the stub ends of the current freeways in Los Angeles and Pasadena so they aren’t bleeding traffic into the neighborhoods. A federal judge did not think that Caltrans had given this alternative an adequate study citing it in his ruling for the injunction to the SR 710 which is still in place. Of course, Alhambra and pro car-centric proponents will poo-poo this solution, but if it’s good enough for a federal judge, it should certainly be given a fair shake which Metro is not doing now. As bad as it sounds to add more to the highway system, can’t we agree that we need to stay competitive at the ports of LA/Long Beach? the widening of the panama canal, and the creation of a brand new canal in Nicaragua means lots of good union jobs for hard working families are in danger. Closing the gap with a tunnel would help the ports stay much more competitive, would add little change to the SGV. There’s six lanes on Valley in Alhambra? Since when? Except that Metro can’t seem to figure out whether or not the tunnel will actually handle truck traffic. It depends on which story they’re trying to spin at any particular meeting. First, the 710 freeway will be paid for with borrowed sales tax dollars – and the project will NOT create “growth” in LA County. The project’s own feasibility reports states that “growth” will occur in the Inland Empire as a result of the freeway. This is a highway to bankruptcy in a county that is already deeply underwater in unfunded highway (and other) maintenance liabilities. Second, the Panama Canal will drop prices below what the 710 freeway will be able to reduce in logistics expenses. We have barely enough time to figure out what to do when the canal re-opens – and we should get to work finding a way to either shrink our metropolitan footprint(s) or get into some different lines of business before reality comes crashing down on us in a few short years. Delaying the inevitable is not a productive discussion to have right now. We need to focus on real (non financialized) wealth generation as a county – not on siphoning off global corporations for their shipping fees. Third, the only real option we have WRT Panama is to blow the thing up or have the U.S. take it over again. This event is a perfect example of how we are a deeply ***’d people. 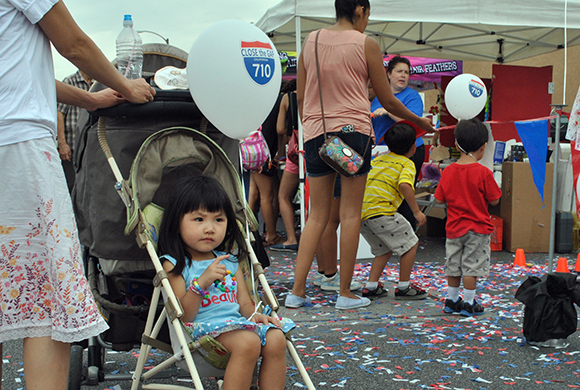 We hold a pedestrian-only festival to celebrate a bloody highway?! God, line this lot up next to the “environmental” fairs that generate more waste per capita than christmas (“Here’s a flyer for my cause!”) and other phony holidays and events like “bike to work” days and lets just have a contest to see how stupid we can make ourselves look to posterity. before reality comes crashing down on us in a few short years. 1) Does this project solve a problem or create one? I believe based on my review of work to-date and personal experience that the 710 north extension would reduce arterial traffic volumes in South Pasadena, Pasadena, and Alhambra, particularly along Valley Boulevard, Main Street, Fremont Avenue, Atlantic Avenue, and Los Robles Avenue. Of course we know that due to the 14 Million+ people that live in the LA region, that new freeway construction will not eliminate traffic on other facilities – rather they will immediately fill to capacity while more traffic fills in on the arterial roads. So I am not sure of the magnitude of the overall reduction. Personally, every time I drive north on I-5 from San Diego or Orange Counties and I see the sign that says “710 Pasadena,” I wish that the extension actually existed so I could reach my destination faster. 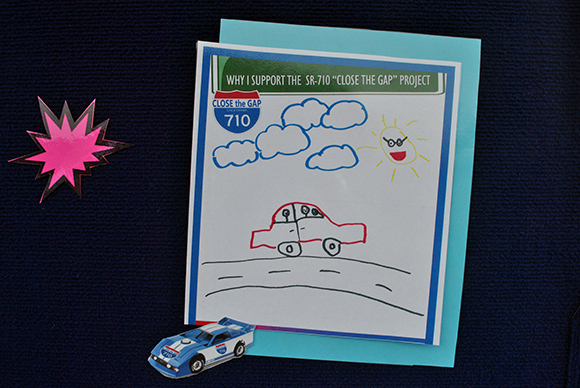 As part of a regional freeway system, the 710 would solve problems. In the broader context of the role of freeways in our region, of course there may be other problems created by the 710. 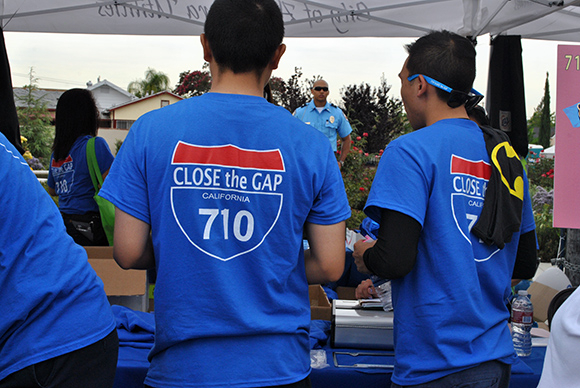 Bottom line, I support extending the 710 as it will address a current problem (increased local roadway volumes due to limited regional circulation alternatives for non-local traffic). In the future I believe our freeway network provides a very viable set of right-of-ways that can be used to expand transit or BRT options. 2) Is this project financially feasible? A very good question, and not the type of question to be answered by an Environmental Impact Report (EIR). The EIR is there to fully evaluate the alternatives, identify impacts, and develop associated mitigation measures. The question of financial feasibility is something for our County leaders to decide. It is my understanding that the 710 extension would likely be constructed as a Public-Private Partnership, so the financial impacts to the County would be significantly lower than a purely public construction initiative. From a regional perspective I must hope that our elected leaders are looking at spending available funds judiciously. Since there are a vast majority of citizens still utilizing our regional freeway system for daily commutes and trips, the need to provide better regional transportation solutions while reducing the impact of non-local traffic on local arterials must be considered alongside questions of regional transit investment and other modes (goods movement, bicycles, pedestrians, etc.). 3) Are there other ways to solve local and regional traffic problems that are more cost efficient? Tough question because when you talk about transportation, each mode and each travel choice has costs associated with it. When I lived in the LA area for 3 years without a personal car, I saved tens of thousands of dollars a year. I had other options – my home and work were adjacent to light rail, and I was a member of a car sharing service that was relatively inexpensive and easily accessible. With my current job, I don’t have the same options and the best, most cost-effective solution for me is driving my personal car. So when we discuss the 710 extension, we have to think of all travel modes when considering cost effectiveness. Drilling tunnels is expensive. But a 45 minute car trip each way with gas at $4 a gallon is still much more cost effective to the daily commuter than a 2 hour trip by bus and light rail with two transfers each way – the person driving a car may spend a little more each day, but they make up for that with 1.5 additional hours per day to spend with their family or doing something else. To answer your question, I think the most cost-effective option is a tolled extension to the 710. Let the private sector design, build, operate, and maintain the extension. Let the private sector take the risk to see if anyone will use the 710. Use the revenue shared from the tunnel (in an agreement worked out with the private sector) to increase transit and other modes parallel to the 710. Then it is a win-win for everyone – people who want to drive can take the 710 extension and pay a toll that more accurately reflects the facility’s true cost, while people who don’t want to drive can have expanded options on transit or other modes. Thank you for opening up this discussion. I find it very interesting that the Alhambra city council would create a massive traffic jab by blocking Fremont Ave to promote a project to ease traffic congestion. Hah! Now they are closing Fremont right in the middle of rush hour! Even though I support a tunnel on the 710 (two lanes, congestion priced with no limit, excess funds beyond O&M redirected to traffic calming improvements in the three cities), deliberately jamming up traffic for Soviet-style education is not the answer. I wonder if anyone has calculated the traffic delays and pollution emitted caused as a result of the closure of Fremont. Once is fine, the second time (during rush hour) is a bit much, but now a third time? As if all the banners along Fremont weren’t enough to generate awareness? Mayor Jeff Maloney sounds interested in turning the current freeway stub into a park.